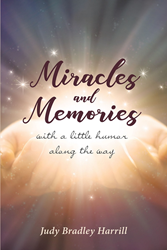 “Miracles and Memories: With a Little Humor Along The Way” from Christian Faith Publishing author Judy Bradley Harrill is the journey of a woman who has experienced a lifetime of blessings and miracles. Through tears of sadness, tears of joy, and tears of laughter, Judy reflects on her life. “Miracles and Memories: With a Little Humor Along The Way”: a testimonial book of what God means to author. “Miracles and Memories: With a Little Humor Along The Way” is the creation of published author, Judy Bradley Harrill. Mrs. Harrill received a degree in elementary education from Western Carolina University as well as a degree in behavioral social science from Mars Hill University in North Carolina. She is married with one daughter and two "grandangels." She retired from the Billy Graham Evangelistic Association and resides with her husband in Asheville, North Carolina. Published by Christian Faith Publishing, follow along as author Judy Bradley Harill reflects on the experiences and memories of her life and reveals the blessing and miracles found throughout her journey. By telling her story in a way only she can tell it, she shares her spiritual insights with the world. Come join Judy as she sheds tears of sadness, tears of joy, and tears of laughter in memory of all those she has known and all that she has done. View a synopsis of “Miracles and Memories: With a Little Humor Along The Way” on YouTube. Consumers can purchase“Miracles and Memories: With a Little Humor Along The Way” at traditional brick & mortar bookstores, or online at Amazon.com, Apple iTunes store, or Barnes and Noble. For additional information or inquiries about “Miracles and Memories: With a Little Humor Along The Way”, contact the Christian Faith Publishing media department at 866-554-0919.